In America, seven people die in house fires every day. This is an incredibly frightening statistic to me because home fires are often completely unpreventable. This post contains affiliate links which means that if you click on a link and make a purchase, I’ll receive a small compensation. Thank you for supporting Fishbowl Family! There are some things we can do to help prevent them like emptying lint screens and cleaning off cook tops, but I am not an electrician or mechanically inclined at all. I would have no idea if our heating equipment was malfunctioning or if something was wired wrong in our attic. If I sit here and think about all that could go wrong for too long, I will probably give myself a mild panic attack. So instead of just fretting, I’m choosing to be proactive by teaching our children what to do in case of a fire. 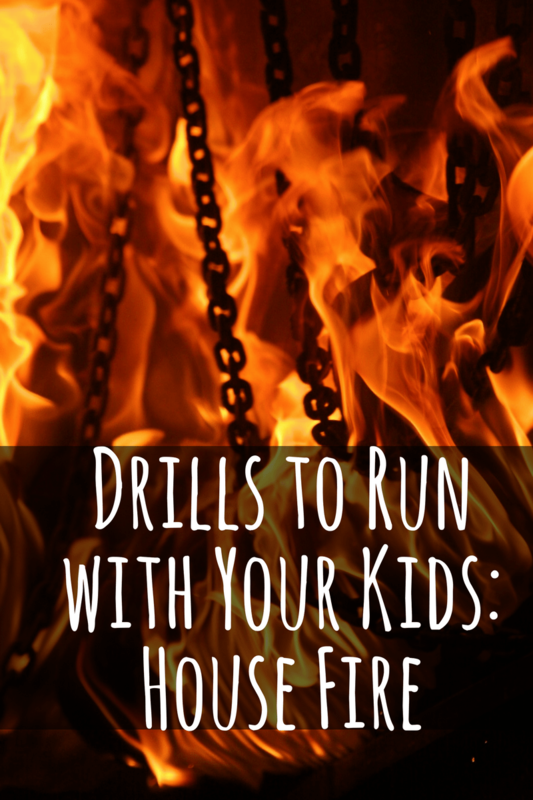 This is the first of a five part series about drills to run with your kids. It’s scary to think about bad situations happening to our children but as parents, it’s our job to prepare them to respond appropriately in all situations – even the scary ones. My husband and I have chosen to prepare our children for the possibility of dangerous situations. We talk openly with them about the situations and run drills to prepare them. We’ve decided that the benefits of preparing our kids far outweigh the consequences. Over the next few weeks, I’ll be writing a series on some different drills that you should consider practicing with your own children. I’m not writing these as a “how to”, but rather to give you an example of how we do it so that you can come up with drills that are best for your family. Before I get into the particulars, let me speak in general about drills. A drill is the rehearsal of a prescribed movement. Whether it’s getting soldiers to march into battle or getting kids to duck and cover in a hallway, the goal is to get a group to move in a predetermined way. Drills help to familiarize people with patterns of movement and the tools associated with the drill so that when the movement is necessary for survival they aren’t confused. An army doesn’t depend on a soldier to use an unfamiliar rifle. Don’t depend on your son to escape through a bedroom window he has never opened before. Drills also perform an important psychological function in developing teamwork, discipline, self-control, and optimism. As adults we understand that our preparation does not impact the path a tornado will take, but kids draw comfort from knowing that they have trained for this and they are ready. That optimism makes them more likely to follow the plan and, if it is a good plan, more likely to survive. Our first step in running drills with our kids is always to sit down and talk to them in a calm environment. This is usually at home after dinner on a Friday night. We talk about the actual situation. We talk about our expectations for their behavior. We answer any questions they have. After 1,853 all the questions are answered, we begin to actually walk them through the steps of what they should do. We talk about what to do, we model what to do, we watch them do it, and then we repeat the whole process until it becomes second nature for them. A drill should eventually be as close to reality as possible, so we aim for our drill to be progressively more difficult. The first run through is nice and calm. By the tenth run through the alarm is going off the whole time and we are blasting the sound of a roaring fire through a bluetooth speaker. Again, this is what our family does – not a step by step guide for what your family should do. You will have to take into consideration your home layout and your children’s ages among other things. After discovering the fire is near, they are to stuff clothing or towels against the bedroom door to slow the smoke coming into their bedroom. (This step should be pretty easy since their floor is usually covered in dirty clothes.) They then go into the adjacent bathroom and stuff towels or clothing against the bottom of that door as well. The next step is to put wet washcloths over their nose, put a little bit of water in the bathtub, and sit on the edge of the tub. There are several reasons for this. First, a wet cloth over your mouth and nose helps to filter out some of the smoke and noxious substances in the smoke. This method is almost universally endorsed as a way to give a person in a fire more time. Second, a bathtub filled with water gives them a way to keep the clothing under their door and on their faces wet. Additionally, if the door were to catch fire, they could throw a towel in the tub and then on the door without getting too close to the flame. Third, their bathroom has an exterior window that is near our bedroom. If we wake up to a house fire, my husband is going to run out our patio door and break their window to get them out quickly. We train them to go to the bathtub so there will no chance of us losing a child in the house. A child wakes up to an incredibly loud noise, and they’re scared, so they wander through a smoke filled house trying to find their parents. They pass out somewhere from smoke inhalation, and the firemen aren’t able to find them in time. Just typing that and thinking about it happening to one of my precious children makes me tear up. Yes, it’s scary to think about this awful scenario ever happening to your family. Yes, it does scare your kids by making them think about a terrifying situation. Yes, it does mean you’ll have to deal with 312 extra questions related to fire safety everyday. But it also saves lives. Training your children how to behave in an emergency situation can save their lives. People often make the mistake of thinking that their child will behave in a way that makes sense to adults. When we began this training process with our kids, we asked Dax, 5, what he should do if he wakes up and there’s a fire in the house. His first response? My husband and I were shocked that he would think he needed to hide from fire. But why wouldn’t he? He’s five, fire is scary, and you hide from scary things. His logic is actually pretty sound, but most importantly, we’d never taught him to do anything different. 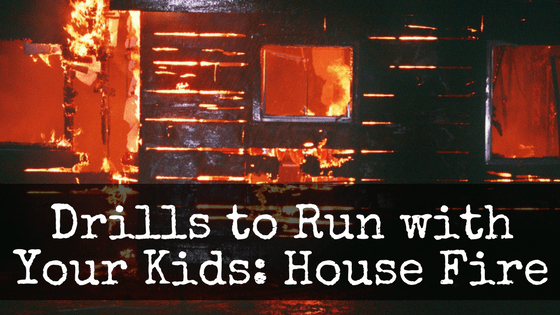 So, talk to your kids about what you want them to do if there’s a fire in your home. *I’ve had some questions about what procedures our other kids are to follow since they don’t all sleep in the same room. For our eight year old, steps one and two are basically the same. She is to go check the door for heat to know if the fire is near, and then stuff clothes under the door. Her next step is to climb up into her window (it’s a bump out window that we’ve made into a window seat for her). We’ve put a small hammer and a pair of protective eye glasses up there for her. She’s supposed to open the window and climb out. We discovered during a drill that she has a really hard time doing this even under the best of circumstances. That’s why the hammer and goggles are there. If she can’t get the window open, then she will break it. She will lay her blanket and pillow over the broken glass and crawl out. Sometimes people are surprised at our expectations of our children in emergency situations and everyday life. I get that this may seem like more than a child can handle. Maybe it actually is. My husband and I are firm believers that children will do their best to live up to what you expect of them. We expect our children to be able to differentiate between a life threatening situation and play time. I expect that in the situation that we have prepared them for, they will behave in a manner that is close to, if not exactly like, their training has taught them. You may not feel like you could trust your 8 year old to bust out a window. But don’t discount it as a viable option in the future. I completely trust that our daughter will not use that hammer unless there is a fire endangering her life. One last thing, our two oldest kids both thanked us for teaching them what to do in case of a fire. So don’t assume that your children are naive and worry free simply because you haven’t filled them in on the plan. What are some ways your family has prepared for a home fire?